Popes John XXIII and John Paul II are being canonized now by Pope Francis in a ceremony witnessed by huge crowds gathered in St. Peter's Square, Vatican City. 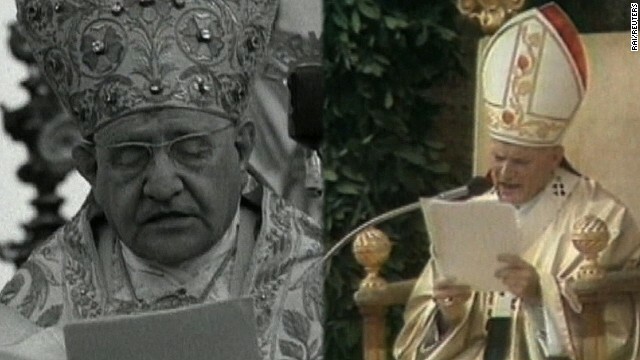 Millions are watching around the world as the two former pontiffs were installed as saints. The faithful and the curious had packed the streets of Rome around the Vatican before dawn, filling them wall to wall for blocks in hopes of catching a glimpse of church history in the making. The Vatican expects 1 million people to gather in St. Peter's Square and along roads leading to St. Peter's Basilica for the unprecedented dual canonization of the two popes, followed by a Mass which is now on and you can catch it live on CNN.